So you think this football World Cup is crazy? Well, you haven't seen everything yet. Here is a list of 10 most infamous on-pitch violence incidents in football history. It's best to be neutral and not mention who started the brawl, but the whole world saw this rare sight during the 1995 English season. Down in the dumps with a 3 goal deficit against Aston Villa, Newcastle players Kieron Dyer and Lee Bowyer started a brawl out of the blue. Both players were sent off to the chagrin of skipper Alan Shearer, and don't even ask about the humiliation from the British press. QPR defender Joey Barton works on the theory that if you are sent off, then why not kick another player. Ah, who could forget the good old Zinedine Zidane headbutting the chest of Italian defender Marco Matterazzi in the 2006 World Cup final in Berlin, Germany. In his defense, Zidane maintains that he retaliated to Matterazzi's trash talking. Zidane was rightly sent off and Italy went on to win the final, though not necessarily due to this incident. When Ryan Shawcross tackles, he does it recklessly. And he makes sure that the opponent is left with a broken leg. If you are an Arsenal fan, you may want to skip this video as it must still make you mad. Aaron Ramsey's career was never the same again. A similar incident as the last one but with a more honest attempt to break the opponent's leg. Roy Keane, the mercurial Irish star is known for his temper. And his time at Manchester United was anything but peaceful. A small glimpse. Well, well, well. To take the matter a step further. It is the 2010 World Cup Final with Holland playing Spain. The Dutch midfielder thrusts his studded boot on the chest of Spanish star Xabi Alonso. Lucky for him, the referee was in a good mood to ignore rough play in this very rough game. De Jong was able to get away with the violent kick with just a yellow card. We are just glad Xabi Alonso got away with it alive. Apart from being an all-time soccer legend, Diego Maradona is also known for his temper. After he joined Barca, he broke his ankle due to a rough tackle by Basque defender Andoni Goikoetxea, who often boasted about the incident. When his side faced Athletico Bilbao for the first time in 1984 since the incident, that's how he took his revenge. The pitch soon presented the scene of an Iberian battlefield. Arguably, the most bizarre game in the history of world cup football. It is Italy playing Chile in . The visuals you are about to see are only best described by the presenter of the show that they are taken from. This is what happens when the teams are more concerned about hurting each other than scoring a goal. He was probably hard done by his reputation when he was sent off against Germany in this World Cup, but Pepe has certainly worked hard to earn it. This is his display of anger against the Getafe striker Francisco Casquero, who is arguably the most badly beaten player in a sport other than boxing or wrestling. 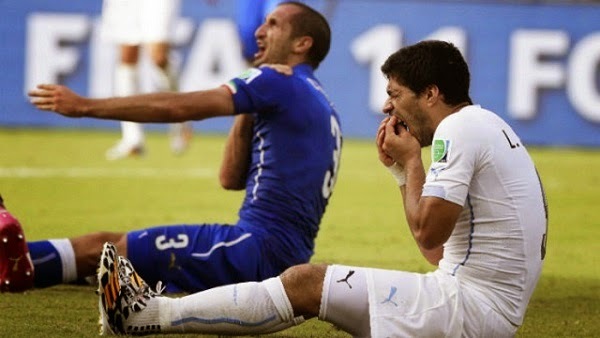 There is no parallel of the audacity of Uruguayan menace Luis Suarez in the history of football. The man does not even care about the presence of hundreds of cameras around the playing field. Amazingly, he has bitten players, not once, not twice, but thrice. Don't take our word for it. Watch for yourself.